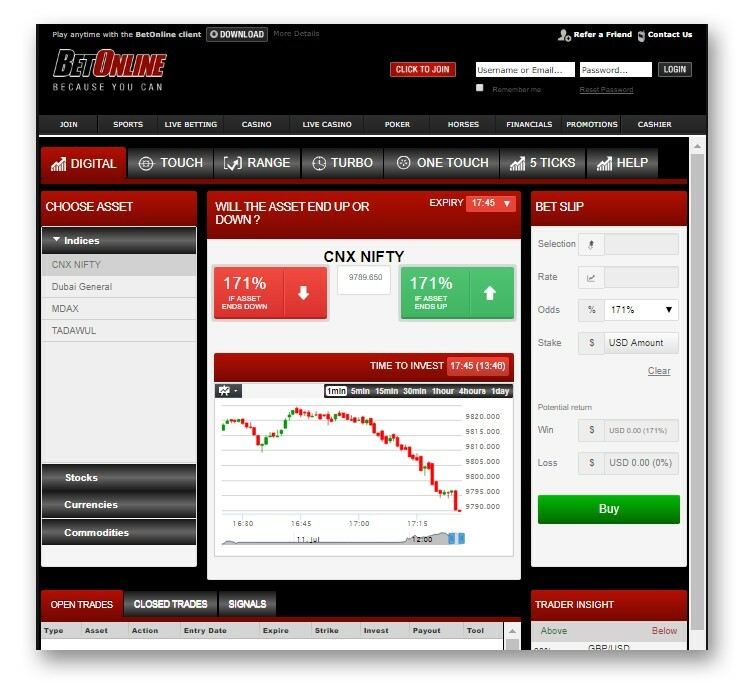 BOL Financial, binary options online trading on a gaming website. BOL Financial is an extension of BetOnline, a leading online gaming site, which deals in binary options online trading. Although the primary focus of BetOnline is casino and sports betting, it has expanded its product offerings to cover binary options online trading due the popularity of it among small time players. With BOL Financial trading platform, they have managed to open up the world of financial trading to gamers from all over the world including those from the U.S. With its user friendly trading platform, BOL Financial is ideally suited to casual traders who want to dabble in financial trading occasionally without having to deal complicated trading terminologies or trading orders. Operational since 2004, BetOnline is an online gaming site that offers casino games, sports betting, horse racing wagers and recently binary options online trading. The site is ranked one of the top 60 online betting exchanges in 2006 according to Casino City Press. Until recently, BetOnline has begun to offer binary options online trading to its members under BOL Financial. In this respect, BOL Financial differs from other binary options online traders in the industry as the binary options online trading services offered are just an extension of BetOline’s core business. With its head office in Panama City, BOL Financial accepts traders from all over the including those from the U.S. The trading platform also comes with a trading history section which traders can refer to check on their open and closed trades. There is also a trader insight indicator which shows the sentiments of traders towards selected underlying assets. Despite the popularity of mobile trading apps among binary options online brokers nowadays, BOL Financial does not have any dedicated trading apps for iPhones or smartphone users. But this is hardly surprising as BOL Financial is not a dedicated binary options online broker but an extension of BetOnline. Nevertheless, BOL Financial web based trading platform works just as well on mobile devices as desktop computers as the trading screen is scalable. Stocks: Amazon, Alibaba, Apple, Baidu, Bank of America, Best Buy, Boeing, CISCO, Caterpillar, Citigroup, Coca Cola Co, Disney, Ebay, Eli Lilly, Expedia, Exxon Mobil, Facebook, FedEx, Ferrari, FitBit, General Electric, GoPro, Google, Home Depot, IBM, Intel, JPMorgan, LendingClub, Line Corp, Lockheed Martin, Manchester United, MasterCard, McDonald’s, Merck, Microsoft, Morgan Stanley, Netflix, Nike, PayPal, PepsiCo, Pfiser, Qualcomm Inc, SnapChat, StarBucks, T-Mobile, Tesla Motors, Time Warner, Trip Advisor, Twitter, US Steel, Visa. Currencies: AUD/CAD, AUD/CHF, AUD/JPY, AUD/NZD, AUD/USD, Bitcoin/EUR, CAD/JPY, CHF/JPY, Dash/Bitcoin, Dash/EUR, Dash/Ethereum, Dash/Litecoin, Dash/USD, EUR/AUD, EUR/CAD, EUR/GBP, EUR/JPY, EUR/USD, Ethereum/Bitcoin, Ethereum/EUR, Ethereum/Litecoin, Ethereum/USD, GBP/AUD, GBP/CAD, GBP/CHF, GBP/JPY, GBP/USD, Litecoin/Bitcoin, Litecoin/EUR, Litecoin/USD, NZD/USD, Namecoin/Bitcoin, Namecoin/USD, Novacoin/Bitcoin, Novacoin/USD, Peercoin/Bitcoin, Peercoin/USD, USD/CAD, USD/CHF, USD/JPY, USD/NOK, USD/SEK. As BOL Financial is not a dedicated binary options online broker, their trading account setup and bonuses offered are different from what the binary options online trading industry has to offer. For example, a trading account at BOL Financial can also be used for betting on other gaming activities offered by BetOnline. Although there are bonuses and promotional deals offered by BetOnline, these bonuses and promotional deals are not specifically for binary options online trading. Instead, they are geared towards casino games and sport betting. Hence, if you are a binary trader that enjoys an occasional bet on casino games or sport betting, you can take advantage of several bonuses such as “Refer a Friend” bonus, 50% Welcome bonus, Risk Free Bets, Free Plays and Match bonuses. The customer support service at BOL Financial is available on a 24 hours a day 7 days a week basis. This is reassuring for BOL Financial’s traders as they will be able to obtain assistance from the support team whenever they are experiencing any problems. Nevertheless, the methods of communicating with the customer support team are rather limited to just the telephone or email. The lack of live chat support meant BOL Financial’s traders are at a disadvantage as compared to traders with dedicated binary options online brokers. In terms of extra features or resources, BOL Financial does not have any which are specific to binary traders. However, there is one feature that is found on BOL Financial’s website which makes it stand out from all the online platforms that offer binary options online trading, that is the exceptionally high payout offered by BOL Financial. While the average returns offered by most binary options online brokers ranges from 75% to 95%, BOL Financial’s payouts ranges from 160% to 180% on the average. In addition, BOL Financial’s traders are also able to adjust their trades based on their risk appetite. This is done through the size of the refunds that BOL Financial’s traders want to receive should their trade closes out of the money. Is BOL Financial a suitable platform for beginner binary options online trader? Yes. BOL Financial is a good platform for beginner traders as their trading platform is user friendly and requires no download and installation. How can I control my trading risks? BOL Financial’s trading platform allow you to control your trading risks by letting you adjust the payout percentage against the rebate that you will get should your trades close out of the money. What types of options contracts are available at BOL Financial platform? At BOL Financial, there are 6 different types of option contracts available. They include 5 Ticks options, Digital options, One Touch options, Range Options, Touch options and Turbo Options. What methods are available for depositing funds at BOL Financial? There is a wide selection of payment options which BOL Financial’s clients can use to deposit funds into their trading accounts. These include Bank Wire Transfer, Bitcoin, Cashier Checks, Credit/Debit Cards, Litecoin, Money Orders, Neteller, Skrill and Western Union. Is BOL Financial a scam? No. BOL Financial is not a scam. They are an extension of the BetOnline’s website which has been operational since 2004. How do I open a trading account at BOL Financial? To open a trading account at BOL Financial, simply click on the “To Join” button located on the BetOnline homepage. Fill up the registration form and submit it. This will allow you to gain access to the website. Once your registration has been confirmed by through the confirmation email, your account will then be activated. Once you have deposited some funds into your account, you will be able to start trading on the BOL Financial trading platform.